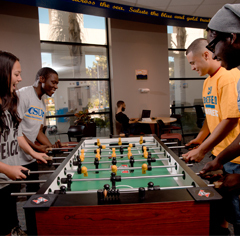 CSUB’s Student Union provides a comfortable place for students to meet, organize, and attend a variety of events. At the heart of the Student Union is a casual lounge, which gives students a fun, relaxed setting to unwind between classes or after a long day. Computers are available for surfing the web, in addition to couched and low tables for studying, casual reading, playing games or conversing with friends. The Student Union is also home to “Rowdy's Place,” a cafe featuring food from Panda Express, and forms of entertainment like billiards, ping-pong, and multiple television monitors. Visit the Roadrunner Bookstore for textbooks and campus branded items, or have a latte in our Starbucks. The Student Union houses offices for various groups, including Associated Students, Inc. (ASI), the Student Involvement office, and Campus Programming. There are additional rooms - the Blue, Green and Yellow Rooms - that can be checked out for club meetings or group study sessions. The "R"-Cade Room has PS3, PS4, Xbox 360, Xbox One and Wii U consoles for student use. Finally, the Student Union has a Multipurpose Room (MPR) that can be used for large conferences, resource fairs, movies, church services and more. One week each month, the MPR is dedicated to the "Best. Week. Ever." where students can come have fun between classes with a different activity each month, from video, board and card games, to multiple billiard tables to even escape rooms and virtural reality demonstrations. In Spring of 2018, students voted to approve a referendum to finance and build a new expansion to the Student Union. #OurNewSU will include a large ballroom that can be used for larger events, an expanded lounge area, a specially designed room for games and other activities, additional study and meeting spaces, and much more. Our mission is to enhance the quality of the student experience through the development of and exposure to campus programs, activities, and organizations in a student centered environment.